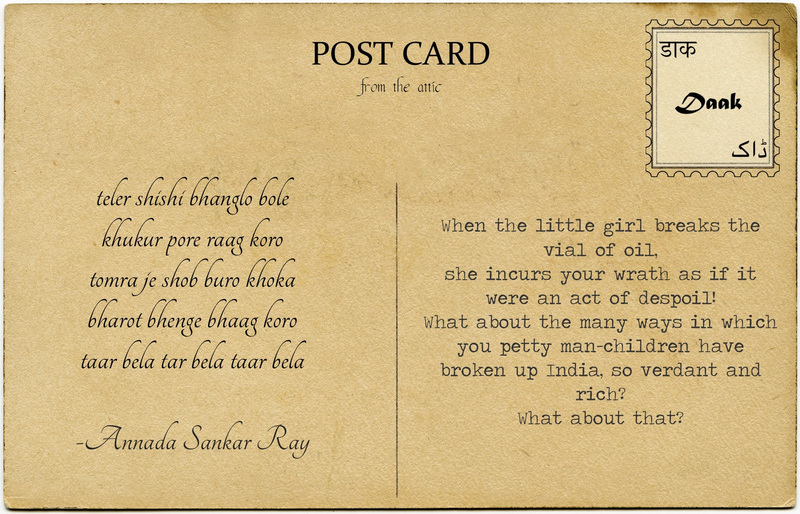 Annada Sankar Ray (1904-2002) was a Bengali and Odia poet and essayist. Best known for his rhymes, his work covers a range of diverse social and cultural topics including a famous travelogue to Europe. The themes of his rhymes contain social and political commentary as well as scenes from the everyday. We bring to you one of his rhymes titled ‘Khoka O Khuku’ in which he questions the logic of partition and mocks the “man-child” who engineered it. He sketches a vivid imagery of what life in the 1940s must have looked like, and lists the various people and institutions that would be ripped apart due to this vicious act of partition. What a bridge between the world of politics and that of young children, introducing them early on to the inane world of adults! you’ve even divided the peon, the police officer, and the professor! The canons, the planes, perhaps even the guns with blanks? you’ve managed to divide the horses and camels to boot…. It will all be a fantastic loot!